Mons. Romero’s words were full of courage and hope – two things that were sorely needed in El Salvador at a time when fear reigned. He was not prepared to simply just talk about the love of one’s neighbour and the need for peace. He fearlessly named the injustices that were at the heart of the conflict in Central America during the late 70s and 80s and his faith gave him the strength to do so. Mons. 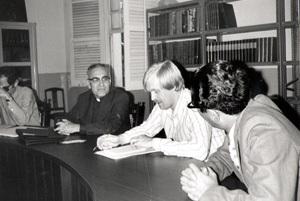 Romero understood that real change for the poor and oppressed of El Salvador would happen only when the root causes of injustice and poverty were dealt with. In this way he has been a great inspiration for our work at Caritas. He knew that there would be no development without peace but just as importantly, there would be no peace without justice. This is the message that Mons. Romero bequeathed to us and thirty years after his death, his words and image are still powerful enough to encourage and comfort us. Mons. Romero taught me personally to stand back every now and again to take the long view. We cannot do everything, and there is sense of liberation in recognising this. But what we can do, let us do it, and do it really well. I thank Mons. Romero for giving me those words of wisdom. Christians hold him as a saint and martyr and many still pray and wait for this to be officially recognised by the Church. For Salvadorans whose lives were touched by him, Oscar Romero is the rock that has helped them weather many storms. He is the man who loved and protected them and who reminded the world not to turn away in the face of suffering.